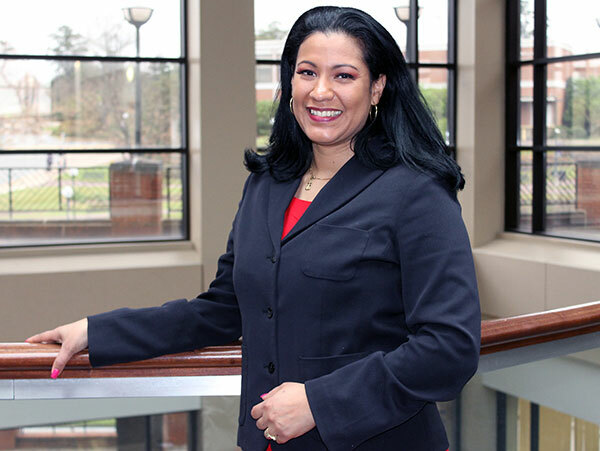 A business major with plans for entrepreneurship, Sandra Mejia is a shining example of how non-traditional students can take leadership roles at Middle Georgia State. Full Name: Sandra Milena Mejia. High School: Instituto Tecnico Nacional de Comercio, where she played volleyball and basketball and was part of the cheerleader team, which won national championships twice. Family: "I am married to Lenny Mejia and we have two children and one dog. Melany is 13 Valentin is 11. Our dog’s name is Luna." Employment: "I am a VA work-study student at MGA. I have the pleasure of working for two wonderful organizations, Career Services at the Macon Campus and the Student Success Center at the Warner Robins Campus." Degree Objective: Bachelor of Science in Business Administration with a concentration in Management. Peer Career Advisor Club, 2016 to present. Conducted weekly Spanish workshops, 2017. Member, National Association for Leadership and Success, 2017. School of Business Dean’s Ambassador, 2017 to present. SGA Senator, Warner Robins Campus, 2018. Career Goals: "My short-term goal is to pursue my master’s degree after I graduate in May 2018. I would also want to find an excellent job where I am valued and I can acquire experience and opportunities to growth professionally. My long-term goal is to open my own business." She chose Middle Georgia State University because … "The convenience. It was the closest University to me and I wanted to be able to attend classes in person." The greatest thing she discovered about Middle Georgia State was … "I heard about the Student Success Center from a professor. I believe that I couldn’t have made it this far today without the guidance, support, and mentorship of Jeannie Ruggerio and Sandy Callaway at the Warner Robins Campus. Later on, I met another mentor, Dr. Melinda Robinson Moffett, at a club rush and I decided to join her organization - MGA's Career Services office - because I wanted to learn from her. I wanted to develop my presentation and professional skills and I felt that I was going to gain so much by working with her. Since then, I have met more and more wonderful people and become extremely involved with the University. I have found my greatness here by being involved and serving others. Being able to inspire and help others keeps me motivated and happy." Her greatest academic experience as a Middle Georgia State student has been … "My capstone class, 'Strategic Management,' in which I am able to apply the concepts learned previously in my business core classes. This hands-on learning approach has allowed me to use my management skills, such as making strategic decisions in all functional areas of management (finance, marketing, and operations) in a competitive environment to ultimately reach the organizational goals. I am also able to acknowledge my leadership and analytical skills that will help me in my future endeavors." To her, “greatness” means … "A wonderful state where a person feels happy and complete. A person who knows who she is, what makes her happy, and where she is going. I feel that I have found myself here at the University. Being involved with the school has reminded me of who I am. I will never forget all the people who have helped me and challenged me in this amazing journey." In five years … "I see myself working for an amazing organization that supports my ongoing education because I would like to be working on my doctorate degree by then."